This page describes how to connect Bamboo to a PostgreSQL database. 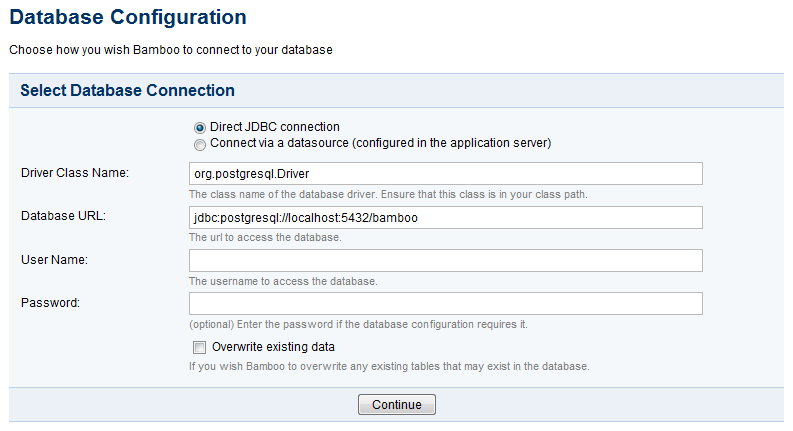 Note that the JDBC driver for PostgreSQL is bundled with Bamboo. You do not have to download and install the driver. See Supported platforms for other information about the versions of PostgreSQL supported by Bamboo. If you are connecting Bamboo to a remote PostgreSQL server (i.e. if your PostgreSQL server is not installed locally on your Bamboo server host system), you will need to configure your data/postgresql.conf and data/pg_hba.conf files to accept remote TCP connections from your Bamboo server's IP address. Once you have modified your data/postgresql.conf and data/pg_hba.conf files, you will need to restart PostgreSQL for your changes to take effect. Creating a completely empty Bamboo database is recommended. Avoid using templates to create the database as some may insert default tables which can lead to conflicts when setting up Bamboo. Bamboo provides two ways to connect to a PostgreSQL database — using JDBC or using a datasource. JDBC is generally simpler and is the recommended method. For both methods, run the Setup Wizard and choose the Custom Installation option. On the 'Choose a Database Configuration' page, choose External Database, select PostgreSQL 8.2 and above from the list and click Continue. Driver Class Name Type org.postgresql.Driver (if different from the default). Driver Class Name Type the URL where Bamboo will access your database (if different from the default). For details about syntax, please refer to the Postgres JDBC driver documentation. ユーザー名 Type the username that Bamboo will use to access your database. パスワード Type the password (if required) that Bamboo will use to access your database. Overwrite existing data Select if you wish Bamboo to overwrite any tables that already exist in the database. For details about the syntax to use for the JDBC database URL, please see the Postgres JDBC driver documentation. JNDI name Type the JNDI name of your datasource, as configured in your application server.